Kyrie Irving is done. And likely so are the Boston Celtics. Boston Celtics guard Kyrie Irving will miss the rest of the regular season and the playoffs. Losing Irving probably ruins the Celtics’ chances of winning the NBA title. It also takes a big bite out of Boston’s odds of even advancing deep enough for, say, a rematch of last year’s Eastern Conference finals against the Cleveland Cavaliers. 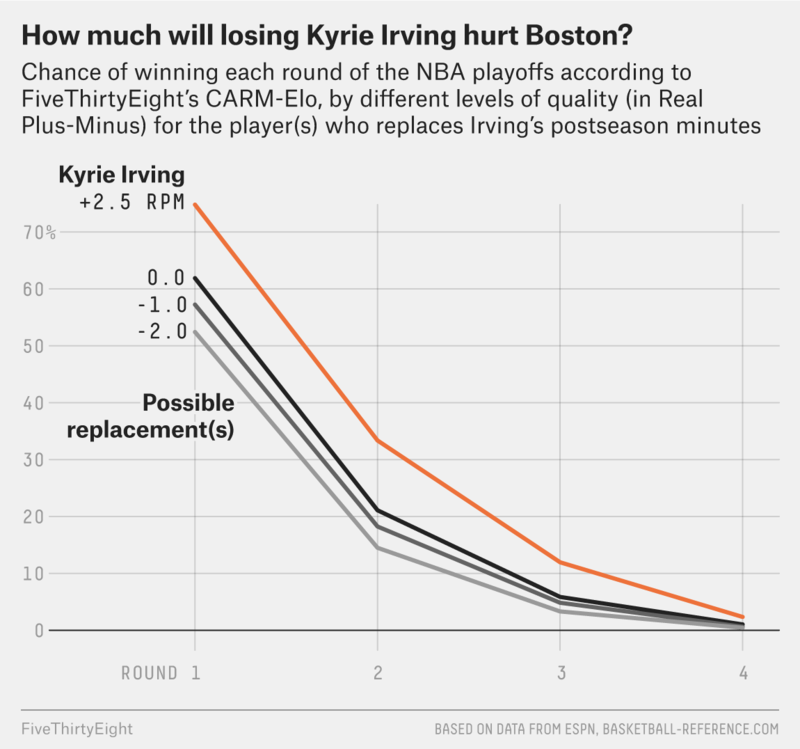 We can model out just how much losing Kyrie figures to hurt Boston with the help of our CARM-Elo ratings and ESPN’s Real Plus-Minus metric. Irving ranks 13th among point guards in RPM this season, with a +2.5 mark (meaning he adds that many points to Boston’s bottom line per 100 possessions). And depending on who’s eating up Kyrie’s minutes — more on that later — losing a player of his magnitude could cost a team anywhere between 50 and 80 points of CARM-Elo (or roughly the difference between the Warriors and the Heat). Beyond that, Irving was also Boston’s second-most-seasoned playoff performer, trailing only Al Horford in career postseason games. Because our model takes playoff experience into account, the loss of Irving is a double whammy for Boston, costing the Celtics talent and crucial familiarity with playoff basketball. Against the Cavaliers specifically, Boston’s chances of winning a seven-game series drop from 41 percent with Irving to 26 percent if he’s replaced by a -1.0 RPM player (or collection of players). So much for the Celtics — and Irving, who got himself traded from Cleveland to Boston last summer — delivering a dose of comeuppance to LeBron James and the three-time defending East champs. Moreover, without Irving to draw defenders’ attention, other Celtics produce less. For example, Smart’s production plummets. He creates 112 points per 100 chances on the pick and roll when he shares the floor with Irving — that’s ahead of even Chris Paul and James Harden. Without Irving, that falls to 91 points per 100 chances, which is more akin to Reggie Jackson. Not great. Larkin, meanwhile, hasn’t played enough minutes alongside Irving to give us a meaningful idea of what that looks like (though what we have seen ain’t pretty), but his production in Irving’s absence has been dreadful. The news gets worse. Irving has been crucially important to parts of Boston’s offense, but the team’s defense has been largely responsible for its success this season. Reason stands that without Irving, the team could fall back on solid defense in an attempt to grind out wins. But while the Celtics remain the season leader for defensive rating, their defense has tailed off in recent months — and more important, so have the underlying metrics. Boston began the season playing suffocating defense, forcing difficult shots on practically every possession. According to Second Spectrum’s quantified shot quality metric,1 Boston forced the second-most-difficult shots before the new year and held relatively steady at sixth from Jan. 1 to the All-Star break. But since the break, Boston has fallen to a three-way tie for 17th in defensive qSQ — meaning that its slide on defense has been more than simple bad luck. That should improve some when Smart returns to the lineup and resumes his bump-and-run-coverage routine, but the season-long trend isn’t in Boston’s favor heading into the postseason. There are some traces of hope, if you squint hard enough. While the Celtics offense gets much less production out of drives to the rim without Irving on the floor — falling from 101 points per 100 chances to 92, per Second Spectrum — some individual players have thrived with more room to work. Jayson Tatum’s points created per drive increase from 87 per 100 chances to 92; Jaylen Brown’s from 82 to 99; Horford’s from 106 to 128 (on a relatively small number of attempts). But Smart’s production again plummets, dropping from 120 points per 100 chances with Irving to 95 without him. For his part, Rozier again stays steady at a lackluster 82 points per 100 chances. From one angle, that only highlights Boston’s cavernous hole at ballhandler. Irving’s absence might lead to more production from players with more minor ballhandling roles, but that improvement is outpaced by decline among the rest of the team, which is reflected in the team’s overall decline. But in a way, that’s fitting for this Celtics team. Early in the season, just after the Gordon Hayward injury, we wrote that Boston would need an outsize contribution from its young lottery picks, specifically Brown, in order to remain competitive this season. And in fact, both Brown and Tatum performed far above expectation, in ways it was difficult to imagine for such inexperienced players. So with them showing signs of improvement in just this scenario — Kyrie out, the defense keyed in on them — maybe it isn’t unreasonable to hope they can rise to the moment. Reasonable or not, the Celtics will need something more from its young stars for the team to have much chance of returning to the Eastern Conference finals, or beyond. qSQ uses shot location, defender location and other variables to measure how difficult a shot is.